If you wish to have Social Media Links within your Email then you can use our tool to insert the icon images. This will also mean you can separately track your social media clicks in your campaign results. This feature is key in allowing your contacts to share your content via social media. 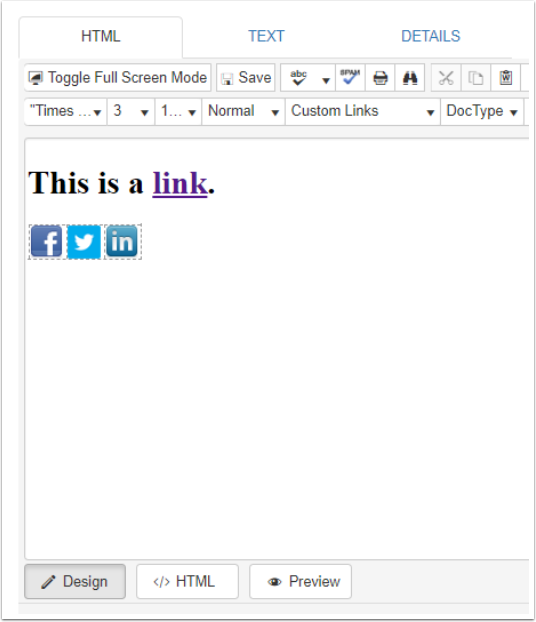 Place your cursor where you would like your social links to be placed. Select the social share icon as shown above. This will bring up a new window. Select which social media platforms you want links for. Choose how you want them to be laid out by picking number of columns. Above I have selected three social media platforms and want them horizontally aligned, so have chosen three table columns. Select for the icons to appear small or large. Here you will see the three social media icons I have chosen. Make sure to check these links work by sending a test to yourself using the campaign send test function.